BEIRUT (AP) — The United States is seeking to broker an agreement between Syrian Kurdish forces and Turkey to prevent them from going to war in northeastern Syria once American forces withdraw, a senior Kurdish official said. 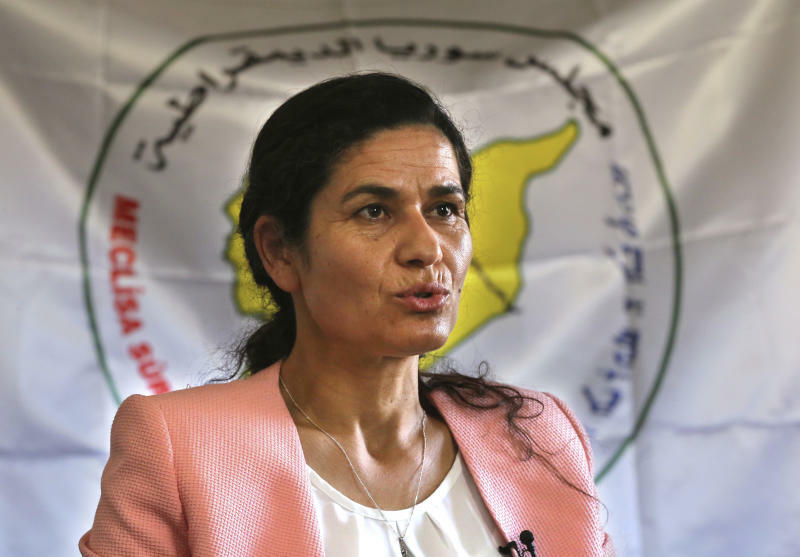 Ilham Ahmed, the co-chair of the U.S.-backed Syrian Democratic Council, said in an interview Monday with The Associated Press that it remains to be seen whether U.S. efforts would be successful. Ahmed has been in Washington for the last few days to lobby for a negotiated U.S. withdrawal that would secure the presence of Kurdish-led forces in areas of northern Syria that they liberated, with U.S. military support, from Islamic State militants. The oil- and resource-rich areas constitute 30 percent of Syria. Plans for the U.S. to pull out created a vacuum that all sides are seeking to fill. Turkey has repeatedly threatened to launch a full-scale military offensive to drive Kurdish forces from the border areas. The Syrian government has sent reinforcements to front lines with Kurdish-backed forces in the east. Ankara considers the Kurdish People's Protection Units, or YPG, which forms the core of a U.S.-backed force, to be a terrorist group. The U.S. has spent months trying to prevent its NATO ally from attacking its partners in the fight against IS. "They are worried about any clashes between the two sides, which they consider as allies," Ahmed said. "So far the plan is unclear, but what is clear is that Americans are seeking a meeting between us and the Turks with the aim of calming down the situation and reaching a solution or settlement for protection." Later Monday, Ahmed exchanged a few words with U.S. President Donald Trump at a fundraiser in Washington — the first such high-level encounter for a Syrian Kurdish official. When asked if he would let the Kurdish fighters be attacked, Trump said he would make sure they are protected, adding "I love the Kurds," according to a person in the room who asked not to be identified. Ahmed had no immediate comment on the encounter. The White House said it has no comment on private conversations. Ahmed said the U.S. is focusing on "calming" Turkey to find a compromise that would allow the Kurdish forces to remain. She has rejected a Turkish proposal for a "safe zone," saying Ankara's control of a 20-mile (32-kilometer) border area would endanger the Kurds. "Turkey's control would mean turning these areas into Turkish colonies controlled by terrorist groups," she said in reference to Turkish-backed Syrian opposition groups. Turkey says it wants to turn the border area into a place where millions of refugees can return. But Ahmed said a Kurdish-dominated area seized by Turkey and its Syrian allies last year in western Syria, Afrin, has been systematically emptied of its original inhabitants. Ahmed said a compromise accepted by her group would be having U.N.-sanctioned international monitors along the border between Syria and Turkey. U.S. officials have yet to put forward a detailed plan for the withdrawal, which Trump announced last month, or subsequent arrangements. Trump has spoken in support of the Turkish plan for a safe zone, but few details have emerged from the talks between U.S. and Turkish officials. Meanwhile, the Kurdish group is also reaching out to the Syrian government's main ally, Russia. Ahmed said they presented Moscow with a framework for possible talks with Damascus. The plan's 11 points include the recognition of Syria's territorial integrity and the inclusion of Kurdish-led forces within the Syrian army following a political agreement establishing a decentralized state. The Syrian government has said it will not recognize Kurdish autonomy. "We need basic points put forward so we can deal with them," Ahmed said, though it remains unclear whether such talks with Damascus will take place. "What we see is that all sides want to keep things as they are for the coming period," she said. She cautioned that the Islamic State group has not been defeated, saying sleeper cells could be "re-energized" after the U.S. pullout. Iranian-backed militias are also deployed in eastern Syria, where they fight alongside Syrian troops. On Tuesday, the Kurdish-led forces battling IS said the militants are holed up in two villages, or around 5 square kilometers (2 square miles) east of the Euphrates River. Spokesman Mustafa Bali said the Kurdish-led fighters have slowed their advance because thousands of civilians, mostly IS family members, are still trapped inside. The International Rescue Committee said Tuesday that over 10,000 people, mostly women and children, have fled IS-controlled areas and reached a camp for the displaced to the north. Regional country director Wendy Taeuber said the newly displaced are in a "desperate state," hungry and dehydrated. She said the U.N. confirmed that at least 12 children died after reaching the camp or during their journey there. Associated Press writer Dan Huff in Washington contributed.